The Grand Canyon-set crime investigation thriller Edge of Eternity is an essentially forgotten 1959 effort from director Don Siegel (Dirty Harry, Invasion of the Body Snatchers) that is worthy of reappraisal. The film doesn't break much new ground as far as cop mysteries go, but economical storytelling, coupled with an appealing cast, make it a sharp and entertaining discovery. 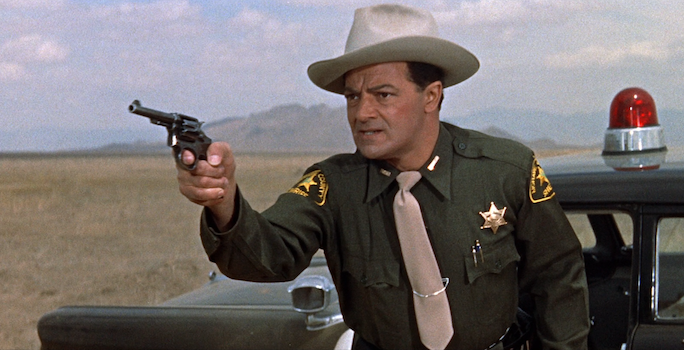 Offbeat action hunk Cornel Wilde (Storm Fear, The Naked Prey) is Les Martin, a sheriff's deputy quietly attempting to forget the mistakes of his professional past. When Les chooses to chase down a hot-rodding honey and give her a ticket, rather than investigate the mysterious appearance of a spooked grey-haired man, he is forced once again to question his own judgment -- after that grey-haired man is found bound and hanged. Les can't ignore the fact that he could have stopped the crime, if he had just decided to let the speeder slide. More dead bodies start turning up, and the local prosecutor starts turning up the heat on Les and his wily old coot of a boss (Petticoat Junction's Edgar Buchanan) to start finding themselves some murderers or start finding themselves new work, come the next election. Les suspects the murders are connected to the disused gold mine, belonging to Janice's dad (Alexander Lockwood), that still has untapped riches for the taking. As per the typical tropes of mystery writing, the murderer ends up being the story's extra character who wasn't serving much else of a purpose. Although, granted, Edge of Eternity has three characters that could fall under that heading: western stalwart Jack Elam as a man who runs tram cars across the Grand Canyon to "mine" for bat guano fertilizer in the caverns, Pocketful of Miracles' Mickey Shaughnessy as the jovial bartender who prods Les to share some laughs in Vegas with him, and Rian Garrick as Janice's absent brother who chooses to rebel against their father from the bottom of a whiskey bottle. If you hate playing guessing games, just squint at the poster artwork on the cover of the Blu-ray and you can pretty much make out which of these gentlemen is involved in the climactic, mid-air tram car fight with Les and Janice. Edge of Eternity probably didn't have too big of a budget, but most of it surely went toward renting aircraft to capture the film's travelogue-quality images of the Grand Canyon. The Canyon is so much of a co-star in the film that it even gets its own single card credit during the film's opening. The aforementioned tramcar fight is a semi-successful mixture of stunt shots, filmed on location over that enormous drop, and unconvincingly matted studio shots. One wishes that the budget or technology was more up to snuff, because that mid-air tussle is conceptually the perfect capper to the film, but practically it plays out as a rare misstep in an otherwise cleanly constructed bit of entertainment. Edge of Eternity comes in a limited edition of 3000 copies. It includes a booklet featuring an essay by Twilight Time's Julie Kirgo. This AVC-encoded 1080p 2.35:1 transfer boasts tremendous clarity and depth. Colors are saturated. No major dirt or damage. Transitions look dupe-y, but that's how dissolves looked back in the photochemical days, so I've got no complaints. The bitrate hovers in the mid-30s (Mbps), leading to no noticeable digital compression issues. Nicely restored DTS-HD MA 2.0 mono audio track, with clear and clean dialogue, plus effective delineation between dialogue, effects, and Daniele Amfitheatrof's musical score. One subtitle option: English SDH, with only occasional typos. Audio commentary by C. Courtney Joyner and Nick Redman - Another solid Twilight Time chat, with plenty of background on the production, the filmmakers, and the cast. Early on, it is mentioned that the film was originally written for Jack Elam to star in, and the mind boggles at how different it would be with him as the main character. Isolated music track - Daniele Amfitheatrof's music, in DTS-HD MA 2.0 mono. A beautiful restoration of a little-known thriller that deserves to be better known. Highly Recommended.